This is my accepted entry for this major exhibit at the Salmagundi Club. I say major because it is the most historic exhibit held at the Club and the one that members submit their best work for. We usually are able to submit 2 or 3 works to be juried for shows and can have all of them accepted. This exhibit only allows us to submit one work. I held several favorites in reserve for this show and I waffled back and forth about which one to submit. I wondered if sending a NYC scene would be like sending coal to Newcastle or would it strike a cord. 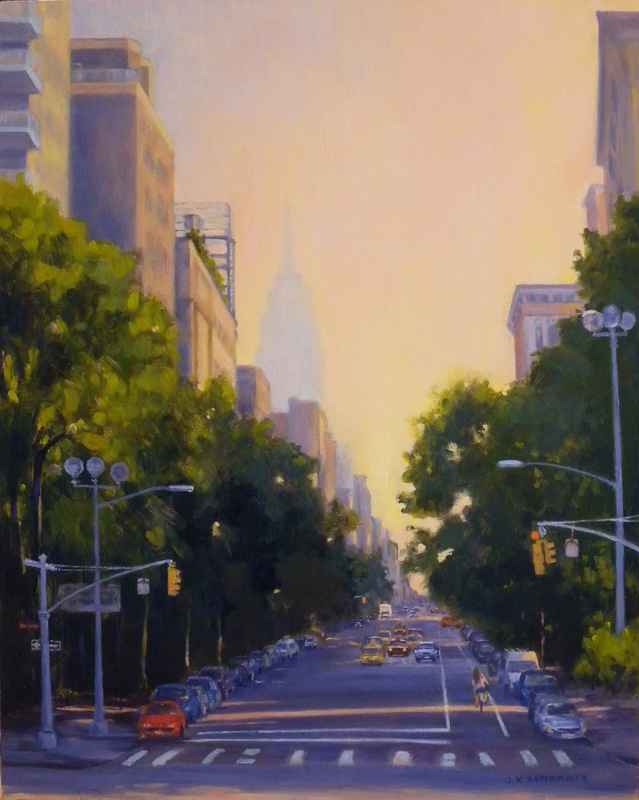 Two of my three candidates were NY scenes. Finally I chose "5th and Waverly". I really enjoy this one and I really enjoyed painting it! Go back on the menu to, I think, either August or September of 2011 and you can watch the progress on this painting from the very first strokes. Maybe it was July? I should have checked first but you can find it. Well, Sandy the "Frankenstorm" is expected to arrive sometime on Sunday evening. I wouldn't mind so much if I didn't feel sure we will be losing power again. All you have to do is sneeze in this neighborhood and the power goes out. Discouraging! I am also annoyed with myself for procrastinating all month about getting out and painting. October offered some beautiful days but I always seemed to have something else that needed doing and I kept feeling there was still enough time to paint the foliage. This year peak color was reached early and now with this storm imminent I think it is fair to say we will be kissing the leaves good bye:( Bummer. Here is the finished version of the painting I have been showing you in progress over the last two posts. Actually I still have some rigging to add on the boat but at this point I want to have the paint really dry. I usually don't wait this long to add details like rigging because I prefer to do lines like that by dragging the end of the handle of my brush through the wet paint. Also there is less at stake at that point. I didn't do that on this painting because the lines would be too light if scraped down to the ochre underpainting. I would rather they be blue/gray and in shadow. I will use my rigger brush, take a deep breath and just do the lines in single strokes. I hope. As you can see I have given it a title. The inlet referred to is the inlet from the Cornell Boat House out to Lake Cayuga in Ithaca New York. We were fortunate to have such a beautiful dawn to witness. ON EXHIBIT: Just a reminder that the exhibition "Color Sphere" runs until November 2nd at the Art League Gallery in Old Town Alexandria. 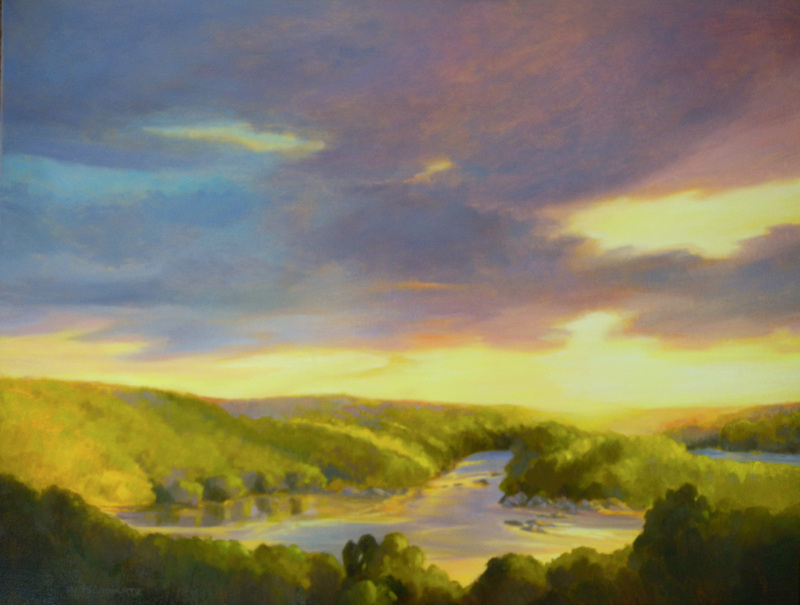 My painting "May Morning Above the Potomac" won an honorable mention in this show. 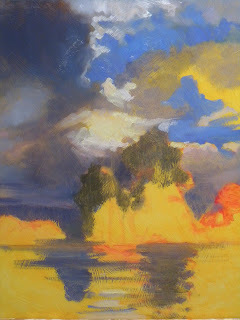 The Art League Bin Gallery has my plein air painting "Fast Moving Clouds" on view for the same dates as "Color Sphere". 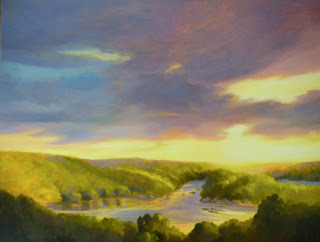 ONLINE SHOWS: American Artists Professional League 84th Grand National can be viewed at www.americanartistsprofessionalleague.org My painting "Camelot on the Potomac" is part of this show. Also online is Audubon Artists Annual Show 2012 at www.audubonartists.org and my painting "Morning at River Bend" is part of that exhibit. Continued good news! Today I received notice that my entry for the Salmagundi Club's Annual Member Exhibit, "Fifth and Waverly" has been accepted for that show. That will take place at the Club in the Main Gallery and I will post an image and dates soon. This is shaping up rather quickly. I was still working wet into wet here but areas of the painting are beginning to set up already and that in between stage is always tricky. I might let the sky dry a little more before adding some finishing touches but the paint on the water is still very wet and workable. I am pleased to be included in so many shows right now and you can read the post below to find links to them. I am beginning to get ready for several small works exhibits which are always popular in November and December. The largest paintings will be 8x10 and I will also have some 6x8's. I will post about them as soon as I know what is going where. Instead of riding everyday I should be out painting in this remarkable weather. I love this season so much! I am outdoors most of the day and start my studio work late in the afternoon. I know I will be spending most of my time in the studio all too soon so I want to maximize the time I have outside. My horse Gypsy is really getting her strength back and I tell myself I need to ride everyday for her sake but really it is for both of us. I will take a day off this week and spend a day painting somewhere. I might go back to the Marion du Pont Center where she was hospitalized and paint that wonderful landscape. Yesterday afternoon I started a new painting. It is 20x16 and is on gessoboard. 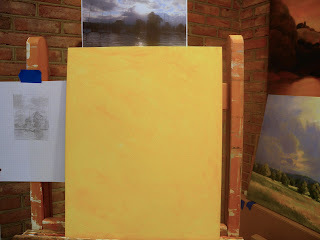 Instead of leaving the board smooth I chose to texture it heavily with gesso and then lay down a yellow ochre underpainting. Sometimes I enjoy the way the grooves left by the gesso brush grab the paint. I had fun just moving color around and making vague commitments. As you will see in the second photo, I do have a plan in mind and the final painting will be very much like I have sketched out. The paint dries more slowly on gessoboard so I will be working wet into wet over the next couple of days. I took it much further today but forgot to take a photo before it got dark. So far so good! The photo below shows the thumbnail sketch on graph paper that allows me to more easily set up the composition on the gessoboard. Perhaps when you click on the photo you will be able to see the texture of the board. 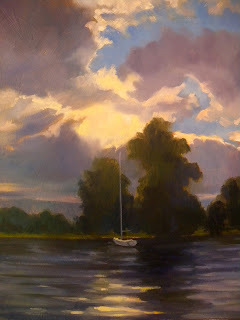 My early morning photo of boats on Lake Cuyuga in Ithaca NY is my color reference and the inspiration for the painting. EXHIBITS: "Sunrise, Sunset" at the Salmagundi Club in NYC closed on October 5th and I am happy to report that all three of my paintings in the show sold. One of them is coming back to my own neighborhood! A neighbor who already owns an 8x10 sunrise painting of mine now has a companion piece in the 8x10 "Millwood Pond, Sunset". "Color Sphere" at the Art League Gallery, Alexandria VA will be on view until Monday, November 1st. On exhibit is "May Morning Above the Potomac". The artists reception will be tomorrow evening from 6:00 to 8:00 PM. Audubon Artists Incorporated, Annual Show 2012, I am participating in this show for the first time and there is much for you to view there as well. 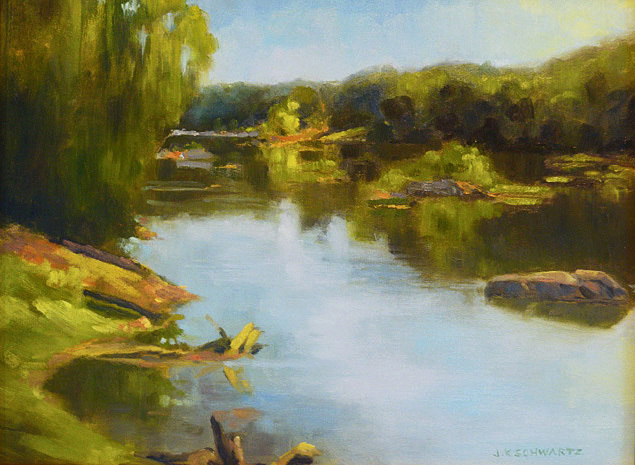 My painting in that show is "Morning at River Bend" and you can view all at www.audubonartists.org This show will also run through December. As many of my artist friends know, exhibiting ones work can be a feast or famine. Like it says in my blog title, the highs and lows of being an artist. Well this month is a feast month. Believe me I can use the boost! www.audubonartists.org and that is where you should go to see the show when it opens on the 9th. I have also accepted their generous offer of membership and I am now an Audubon artist! 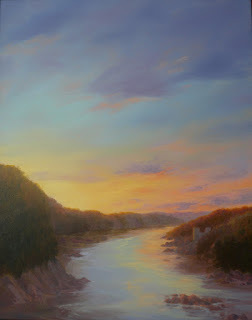 ON EXHIBIT AT THE ART LEAGUE GALLERY: I have just returned from hanging the monthly show at the Art League Gallery. I have enjoyed chairing the hanging committee for over seven years now and I must confess I enjoy it more when I am part of the show:) My committe likes it better too because they don't have to hear the gnashing of teeth or my mutterings. So what I am saying is my painting, pictured above, is part of this month's show. The title of the show is "Color Sphere" and as the theme suggests the gallery is bursting with it! I am also happy to say that my painting received an Honorable Mention. As my fellow Art Leaguer's know it is good to savor the moment because you never know what will happen the next month. That famine I mentioned earlier is not unknown to me. There are so many entries each month and even though the gallery is a large one it is not large enough for all of us. I pity the jurors. 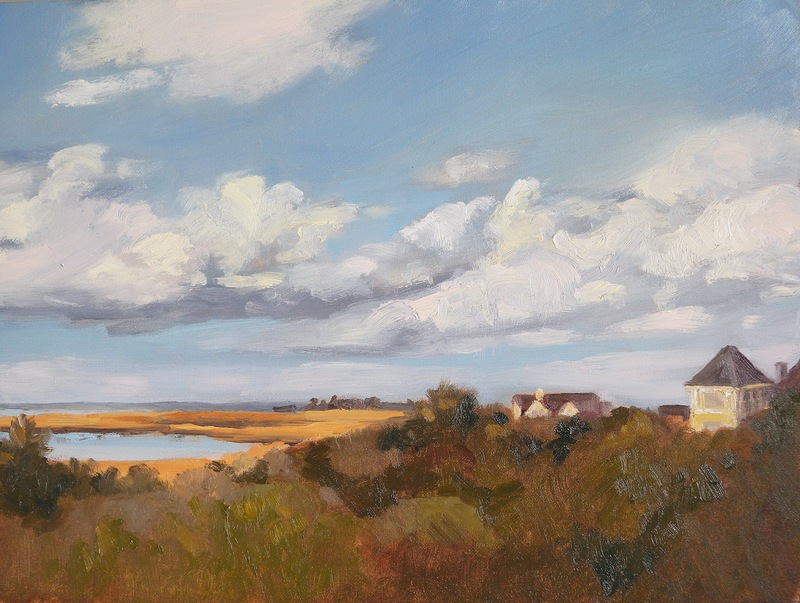 This painting was painted last April from the deck of our house in Duck, North Carolina. 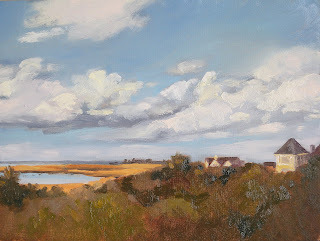 I am painting from the west deck which overlooks Currituck Sound and I am looking North with the bulk of the Sound off to my left. Currituck Sound is another favorite subject of mine, particulary in the evening. The sunsets are incredible! I know I said yesterday that today I was going to write about my thoughts concerning online exhibits but I am running out of steam. That will be a good subject for tomorrow. It is time for me to call it a day! I mentioned yesterday that I have paintings juried in both the Audubon Artists Annual show and the AAPL 84th Grand National. The latter opens first so I will start with that. On the left is the painting that will be in that show. The starting point for the view is looking up river (the Potomac) from the Chain Bridge. For those of you unfamiliar with this area the Chain Bridge crosses the Potomac between Virginia (on the left here) and Washington DC (on the right side). I have painted this view many times but this time I took some liberties with it. In reality there is an arm of land that runs into the river from the right and from the bridge you get the impression that it extends all the way across. It would come across just about at the point where you see the castle but I wanted the river to flow uninterrupted to the horizon. The view beyond that point is true to the site. The castle.....it doesn't exist there. However, it does exist further down the river at the Georgetown Reservoir. I just decided to move it up river because the painting was begging for a castle. Ah, artists license! About the show and the AAPL. Usually this organization holds this show at the Salmagundi Club in NYC. I had a painting exhibited in last year's show and we went up for the opening reception. It was a wonderful show and therefore I was eager to enter again this year. I am really happy to be included again! What will be different this year is the show will be held online. As I mentioned in one of my earlier posts the Club has been experiencing some renovations and it was supposed to be closed at this time to restore the ceiling in the main gallery to its original state as a huge skylight. Because of that the AALP was going to have to find another location. They were not able to find one that offered the space that the Salmagundi has and decided to take the bold step of holding the show online instead. When the Club announced that the skylight plan had been decided against and the regular show schedule could resume it was a little late for the AALP to reverse its plan. So, this will be interesting. www.americanartistsprofessionalleague.org. That is also the link you will need to view the show starting on Saturday. I will keep listing it in future posts. I have some thoughts, both plus and minus, on the subject of online exhibits. There are more and more of them and I would like to talk about that in my next post. Check back tomorrow for the Audubon painting!